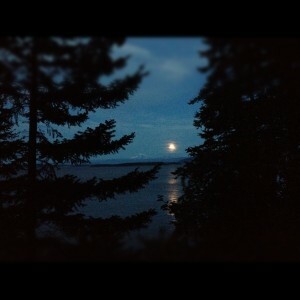 Nothing like a moonlit swim in the freezing Puget Sound to remind you how exquisitely alive you are. Sitting on the bluff overlooking the water, jagged sharp foot-wide perch in between my legs dangling over the edge to sharper landings below, I sat air drying in the near-warm breeze with a towel slaked over my shoulders, staring at the reflections of the moon and lights of Canada and Bellingham and the sultry liquid darkness offering so sweetly to swallow me up. I watched things moving gently, imperceptibly around me, with half my attention while the rest of me ached with the vast meaninglessness of all this. How can it be both indescribable in its beauty yet gutting in these moments of raw futility that always hit me in the middle of the awestruck wonder? Why does that feeling of pain and bottom-of-a-hole despair always have to gently color everything good? Is it that life cannot ever be anything but a dichotomy, two opposing forces pushing against each other to remain standing upright? Would one without the other fail to exist? Would I not truly feel this level of awe and recognition of beauty without simultaneously being conscious of their opposites? I think I love the sea so much because I can always depend on it to be as melancholic and brooding as me.